Why is it that I know about Soulja Boy and Akon and Snoop, but I never knew a thing about Major General Lucius Theus, who lived right in my own backyard? Why is it that most Black Americans also never heard of Theus? As I live in a Black neighborhood, I asked some of my neighbors if they’d ever heard of him. They hadn’t. 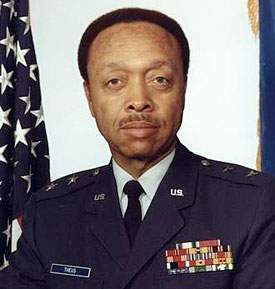 Retired Air Force Maj. Gen. Lucius Theus was a trailblazer in the Air Force and a catalyst for change in the military. Gen. Theus was the first African-American combat support officer to be promoted to brigadier general and one of only three members of the African-American World War II 332nd Fighter Group, known as the Tuskegee Airmen, to receive that rank. Gen. Theus died Monday, Oct. 15, 2007, in Providence Hospital in Southfield. He was 85. He was the driving force of the Tuskegee Airmen National Historical Museum’s fundraising dinner and first winner of the Tuskegee Airmen National Historical Museum’s Major General Lucius Theus Award of Excellence. Gen. Theus, a native of Madison County, Tenn., earned a Bachelor of Science degree from the University of Maryland in 1956, a master’s degree in business administration from George Washington University in 1957, and was a 1969 graduate of the Harvard Advanced Management Program, Harvard University Graduate School of Business Administration. He entered the Army Air Corps in December 1942. He attended the Army Administration School at Atlanta University and served in a variety of cadet and basic training squadrons at Keesler Field in Mississippi. . . . He retired in 1979. His military decorations and awards include the Congressional Gold Medal, Distinguished Service Medal, Legion of Merit and the Bronze Star Medal. . . . He will be buried in Arlington National Cemetery. Send memorial tributes to the Tuskegee Airmen National Museum, P.O. Box 32549, Detroit, MI 48232. Sadly, Lucius Theus will not get the glory that drug pimp, gangster, and cold-blooded killer Frank Lucas gets in the silver-screen debut of “American Gangster” in a couple of weeks. And Denzel Washington will not be bragging about helping get Theus a house the way he did for Lucas–who spent too short a time in prison, just 8 years. Theus bought his own house, thank you. Will Denzel ever portray someone like Maj. Gen. Theus or Dr. John Withers on the silver screen? If he does, it won’t get the attention and the buzz “Gangster” is getting. And we wonder why kids grow up to pursue the hip-hop life of drugs, crime, and loserdom. Thanks, Hollywood. It may be “Hard Out Here For a Pimp,” as the Academy Award winning song goes. But It’s Anonymous Out Here for a Decent Role Model. There are plenty out there. They just aren’t getting any attention. Lucius Theus, Rest in Peace. Debbie, you forget about the dumbass parents too. Blaming the dead moon circus is one thing, but let’s not forget the more important force in a child’s life…the parent. Who is it that’s not teaching them right from wrong, the parent…not hollywood. The thing is, alot of blacks have been brainwashed into thinking they can only do few things in this country. That’s not true and you know it. Why you think there aren’t enough blacks playing in the NHL? Why there are no black NASCAR drivers? Should I name the more simple career feilds in our country…which are being dominated by the illegal aliens? Just cuz “it ain’t from the streets”, doesn’t make it irrelevant to blacks to not pursue the career. So what if there aren’t enough blacks in that career…you know what, SCREW SKIN COLOR. This is america dammit!! If you wanna pursue a career, do it, and don’t worry about skin color. That’s not what get your hired….SKILLS GET YOU HIRED. But unfortently…that’s not the case in a death buster-runned society now. Maj. Gen. Theus is the kind of man not just blacks need to be looking up to, but ALL PEOPLE. But becuase the BETs don’t mention such trailblazers, anyone my age or younger won’t even know who this man is. Disagree. The reason why there aren’t a lot of blacks in the NHL is because there aren’t a lot of of blacks at the junior level because hockey is probably the most expensive sport for kids. Just to register a child in a league could cost $100s. There are more blacks in the NHL than ever, and as times goes by, you’ll see more. America needs more people like you. The Air Force is a younger service, it didn’t carry all of the baggage the other Armed Forces brought to the table. The Air Force is way ahead of rank and file Americans as well as the other Armed Forces in racial equality. Too bad no one was paying attention. It is too late for African Americans to catch up with the onslaught of Latinos and Africans who went right for the money. I expect guys like Jessie Jackson and Al Sharpton to have killed the middleclass African American dream by holding them back from putting their color and origin behind them. It will be just rich blacks and poor blacks (of which, like Veterans, there won’t be a significant amount of voters to influence our political agenda anymore). When was the last time you heard an Ethiopian complaining about jobs and lack of opportunity? Thanks for featuring Maj. Gen. Lucius Theus. I’m a major admirer of the Tuskegee Airmen and it’s good to see men like him given respect and acknowledgement. His accomplishments after his service with the 332nd are just as impressive! The reason we never hear about people like Maj. Gen Theus is because the news media would rather focus on tabloid news rather than real news. It’s the reason why the general public knows more about Britney Spears parenting ability than what our men and women in uniform face in Iraq. Does Hollywood deserve some of the blame? Perhaps. But not nearly as much as the “news” media does. It’s Hollywood’s job to entertain America, it’s the “news” medias job to inform America. Sadly, the “news” media has gotten there job confused with Hollywood’s.